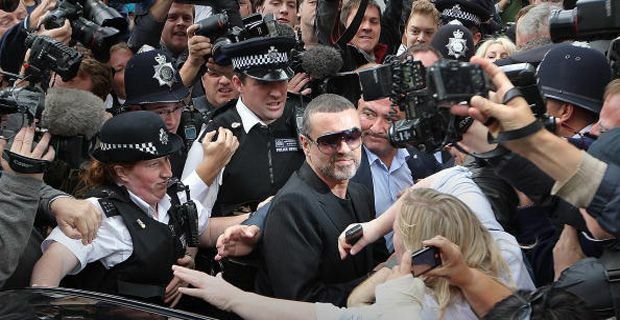 What is it with George Michael, motorised vehicles and catastrophe? OK this time he wasn’t out of his box, it wasn’t hilariously funny, and it was actually apparently relatively serious. He wasn’t even driving according to a spokesman for the singer. The car he was travelling crashed on the M1 during the evening rush-hour on Thursday. One man, not believed to be the driver was airlifted from the scene though his condition is thought to be stable. In a statement, Hertfordshire police said they were investigating the crash, which involved one sole vehicle. Theirs. This raises the possibility that the driver was out of his box, though we stress again – George was not driving. "Police were called at just gone 5.45pm on May 16 to the northbound carriageway of the M1 at junction 6A," the force said in a statement. "The ambulance service and helimed were also in attendance and a man was taken by helimed to a hospital in London. He suffered a head injury. "The exact circumstances of what happened are unclear at this time and until further investigations have been carried out it would be inappropriate for us to comment further. "The northbound carriageway was closed for an hour to allow emergency services to deal at the scene. The southbound carriageway was closed for around 30 minutes to allow the helimed to land." Ambulance spokesman Gary Sanderson said: "A man who we believe to be in his 40s sustained a head injury and following treatment, stabilisation and immobilisation by land and air ambulance crews, he was flown to hospital for further care." Connie Filippello said on behalf of the singer: "George Michael was a passenger in a vehicle involved in a traffic accident yesterday evening, no third party was involved. He is being treated for superficial cuts and bruises but is fine. We have no further comment at this time."